Jukebox musicals have gotten a pretty bad reputation (deservedly so). Trying to wrap a group or singer’s catalog around some artificial, cockamamie plotline almost never works. Those that succeed do so on the strength of the songs, not the contrived narrative. When a jukebox musical succeeds as a bona fide show, it has complex and compelling characters who take a believable emotional journey. The best of these tell the actual life-story of the featured singer(s). Which brings us to “On Your Feet,” a roof-raising musical that tells part of the life story of Gloria and Emilio Estefan, from their respective Cuban-born childhoods (she grew up in Miami), to their meeting, her becoming lead singer of his band, Miami Latin Boys (later known as Miami Sound Machine), their marriage (1978), his management and direction of her career (though the show doesn’t mention how many other Latin stars, like Jennifer Lopez, Shakira and Ricky Martin, he helped launch), through her fabulous breakout crossover hit, “Conga” (1985), up to her serious 1990 accident and 1991 comeback. That’s where the musical ends, despite the fact that the Estefans (she’s now 60; he’s 65) remain active, and have had successful business ventures beyond the music world. None of her numerous accolades — 38 No. 1 hits, seven Grammy Awards , 100 million albums sold worldwide, the Presidential Medal of Freedom and Kennedy Center Honors — are mentioned in the show, nor that Billboard listed her among the 100 Greatest Artists of All Time. But there are plenty of interesting stories in “On Your Feet,” including Gloria’s early singing talent (young Carmen Sanchez, who plays ”Little Gloria,” has a killer, very adult voice), her college major of psychology and her initial reluctance to be in the spotlight; she was a songwriter first. The book (by Academy Award-winner Alexander Dialaris) isn’t concerned with extensive breadth or depth, but it does provide a strong sense of this couple’s indomitability and extraordinary achievements, especially given the prevailing prejudices of the time. The story emphasizes Gloria’s at-first reluctant romance with Emilio (whom she chides for his heavy Cuban accent, a character shtick, though his rapid-fire speech is, in fact, often difficult to decipher), and the painful two-year estrangement from her mother. But the primary obstacles depicted are trying to break into the non-Latin, mainstream recording business, and her recovery from the spinal injury. In this terrific national touring production, brought to us by Broadway San Diego, the two leads have a palpable connection, and they bear close resemblances to the young Estefans. Handsome Ektor Rivera performed the role of Emilio on Broadway. He’s a suave, spirited multi-talent; he moves well, sings well, is charismatic and, as the character, credibly gutsy, and relentless in pursuing his dreams for his wife’s career. Christie Prades is superb as Gloria, a role she understudied on Broadway. She looks beautiful in her many sparkly outfits, and sings and moves like crazy. She could make a corpse want to get up and dance. Her mother (Nancy Ticotin) and grandmother (Debra Cardona) are also standouts, as is fabulous young Jordan Vergara in several roles. He’s been dancing salsa since he was 4 — and it shows; those are some really fast feet! Speaking of dancing, it’s nearly constant throughout the evening, and eye-popping. 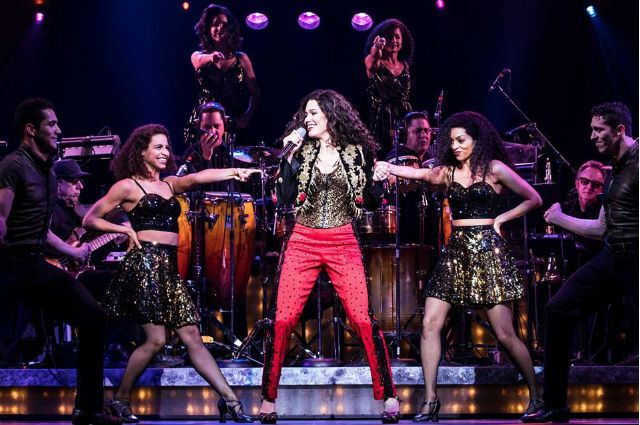 What helps the precision and professionalism is that thirteen of the 28 performers, nearly all Latin, come directly from the Broadway production (which ran for nearly 800 performances), including five members of Miami Sound Machine. Sergio Trujillo’s electrifying choreography, coupled with the dynamic direction of two-time Tony Award-winner Jerry Mitchell, ensure that the energy never flags. All the music in the show was originally produced and recorded by Emilio and Gloria and the Miami Sound Machine. There are many high-octane group numbers (“Conga,” “Get On Your Feet,” “Oye!,” and the buoyant remake of “Turn the Beat Around”), as well as touching ballads of love and regret (“Anything for You,” “When Someone Comes into Your Life,” “I Never Got to Tell You”). The excellent orchestrations are also credited to the Estefans, and the playing is skillfully exuberant . The costumes (Emilio Sosa) are colorful, spangly and ever-changing. The lighting (Kenneth Posner) is vivid and vibrant. The music is infectious. Despite the few biographical dips and difficulties, this is a show filled with pure musical joy. Performances are Thursday at 7:30 p.m., Friday and Saturday at 8 p.m., Sunday at 6 p.m., with matinees Saturday at 2 p.m. and Sunday at 1 p.m.